Home » Key Drug Discovery Articles » The HSP90 inhibitor geldanamycin perturbs endosomal structure and drives recycling ErbB2 and transferrin to modified MVBs/lysosomal compartments. The HSP90 inhibitor geldanamycin perturbs endosomal structure and drives recycling ErbB2 and transferrin to modified MVBs/lysosomal compartments. Cortese K, Howes MT, Lundmark R, Tagliatti E, Bagnato P, Petrelli A, Bono M, McMahon HT, Parton RG, Tacchetti C.
Mol Biol Cell. 2013 Jan;24(2):129-44. Institute for Molecular Bioscience and Centre for Microscopy and Microanalysis, University of Queensland, Brisbane, Queensland 4072, Australia. [email protected]. The ErbB2 receptor is a clinically validated cancer target whose internalization and trafficking mechanisms remain poorly understood. HSP90 inhibitors, such as geldanamycin (GA), have been developed to target the receptor to degradation or to modulate downstream signaling. Despite intense investigations, the entry route and postendocytic sorting of ErbB2 upon GA stimulation have remained controversial. We report that ErbB2 levels inversely impact cell clathrin-mediated endocytosis (CME) capacity. Indeed, the high levels of the receptor are responsible for its own low internalization rate. GA treatment does not directly modulate ErbB2 CME rate but it affects ErbB2 recycling fate, routing the receptor to modified multivesicular endosomes (MVBs) and lysosomal compartments, by perturbing early/recycling endosome structure and sorting capacity. This activity occurs irrespective of the cargo interaction with HSP90, as both ErbB2 and the constitutively recycled, HSP90-independent, transferrin receptor are found within modified endosomes, and within aberrant, elongated recycling tubules, leading to modified MVBs/lysosomes. We propose that GA, as part of its anticancer activity, perturbs early/recycling endosome sorting, routing recycling cargoes toward mixed endosomal compartments. 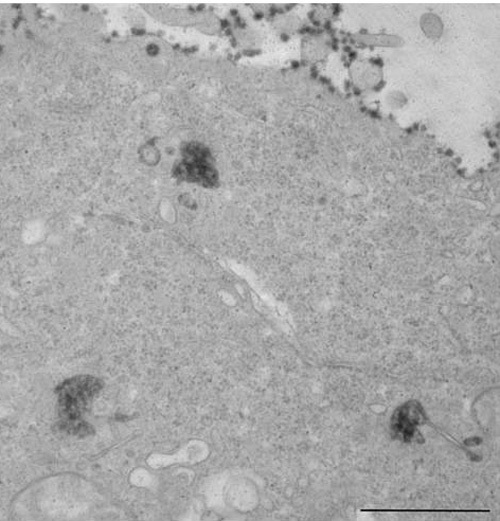 Figure Legend: GA-modified endosomes labeled with Trastuzumab-HRP as viewed by electron microscopy. Scale bar: 1 micron.